This is one of the simple enquiry form. This is one of the easiest method and also very simple to create with the help of html and php. All the company looking for generate leads from website. So this enquiry form is very important to communicate with the clients. 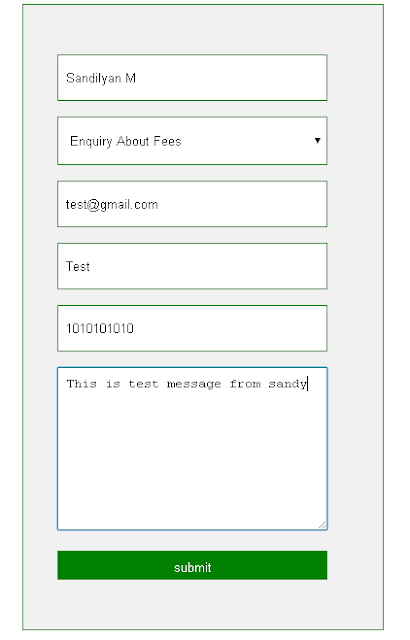 Now will see how to create this simple web form. The form is looks like below image, you can add field and delete the unwanted fields according to your business. The below code is just simple html file. This form is used to capture information from customers. You can add and remove the fields below according to your requirement. And also design the form using css. This is just a form to get data from the user. you can name it as a enquiry.html or index.html. When you submit this form it calls the mail1.php file. This css helps you to design the plain html form as stylish one. You can design the form according to your choice or just add the below css code to your webpage to design the plain html form . This is simple php code to get the form data and stored it to the particular variable and then sent those form information to the Email id using php mail() function, this php code will execute after submit the form so i provided the condition if(isset($_POST['submit'])). 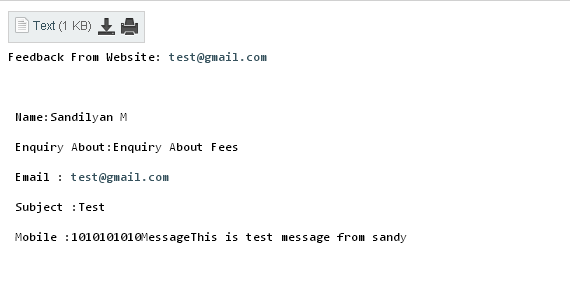 Then i provided to and from email as a admin@sanwebcorner.com , You should change those email ids. But this email id should be domain based email id. Because the php mail function needs domain based email in the from field and you can use to mail id whatever you want like (gmail, yahoomail etc...). 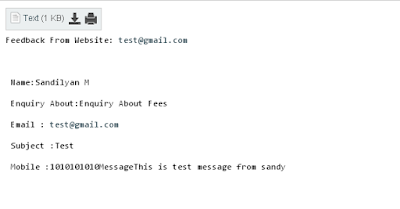 Some cases it won't work better you can use both from and to address as a domain based email. The message will goes to the to email id inbox in some cases it goes to the spam box, Check both inbox and spam folder. If you given same domain based email id (official mail id) then message will comes to your Email inbox. you can download the full Code of php enquiry mail form here. and check the Demo enquiry form here. you can use this enquiry form as a feedback form, contact form, etc. Because it is used send the email with form details. I hope this post is very useful.